The Art of Manliness is a website close the the heart of many Freemasons. For those who have never been there, it’s a guide that explores the lost traits and skills of being a man, and how we can get those aspects back into our live. I highly recommend How to Feel Like a Man, the first video of our Internet Lecture Series and a great primer on something freemasonry stresses in our Craft. It’s just one of many places where the art of manliness and the craft of masonry intersect, which is one reason why the site is so popular with masons. I’ve been reflecting, recently, on the terminology used for the two concepts: the Art of Manliness, and the Craft, which is a synonymous term for Freemasonry in the lodge. Arts and Crafts. Kind of cute. Kind of weird. Why not the Craft of Manliness? Half the posts are learning how to whittle a workbench with a pocket comb and things like that. It’s certainly pretty crafty. And why isn’t Freemasonry called The Art? A good deal of what we can do, in terms of the degrees, is practically performance art, anyway. Stonemasons made gorgeous works of architecture. Can we not be considered an art? Brett McKay called his site the Art of Manliness, because it sounded cool at the time. And Masonry is called The Craft because we’re thematically based on craftsman’s guilds of old. Pretty simple. But what is an art? What is a craft? What’s the difference? If you’ve got a few minutes, let’s ask TED. The definitions of art and craft are not uniform, but in Western Europe crafts predate the arts. This was a time when there was a focus on beauty in the world, and if you had the talent to make something beautiful, or at least the ability to learn to make something beautiful, you apprenticed at a trade guild. Metalsmiths, architects, weavers, carpenters, these were the artists of their time, each forming into a guild of tradesmen under a master craftsman, who designed the craft. If you were rich, and wanted to show it off, you needed a silver serving set made by a master craftsman. They were beautiful, made to exact, repeatable designs and specifications from the master, meeting all standards set by the guildmaster, created by the craftsmen, and assisted in their craft by their apprentices. Your silver serving set was not usually unique. The value of it was that it was recognizable. It carried the master’s trade mark, and could be recognized by guests when serving dinner. People knew they were quality, knew they were expensive, and a symbol of status. Over time the world changed, and the emphasis shifted from the work to the worker. The artwork was absolutely valuable, but more because it was a unique expression of the experiences of the artist; an interpretation of the beauty they saw. Whereas crafts are meant to be repeatable to exacting, high standards, arts were, by definition, unrepeatable. A painting or sculpture was valued, not just for the mark of the artist who made it, but because it was purely unique. It was the only one of its kind, and there would never be another. Copies were just that. Copies. Knock-offs. It’s strange, because empirically there’s not a huge difference. The master mason who designed a basillica, or the master silversmith who designed a tea service, was an artist, making something unique, and really, every duplicate commissioned from the guild could be seen, through artist goggles, as a knock-off of the master’s design. Yes, they meet the standards set by the master, but they will never be an exact duplicate of his work, or his design. So really, this distinction between an art and a craft is, in certain practical terms, a difference in mindset. Art is a work created by the accumulation of experience, skill, expressible point of view, and is entirely unique. Craft is work created by the skills and experience of a skilled artisan meant to meet and conform to exacting standards of the Master. So, if we accept these definitions, you may think that arts and crafts are somehow at odds with each other. Arts are unique and expressive. Crafts are conformist and submissive. Who the hell wants to be conformist and submissive? I want to be unique and expressive. I want to be an artist. I WANT TO DANCE! But here’s the thing. They’re not at odds. They’re partners. That’s why it’s Arts & Crafts. And it’s probably a lesson a lot of modern artists could use, and you may agree if you’ve ever walked through a contemporary art museum. Art simply can’t be the heaving of emotions on to a canvas. Art isn’t simply an egotistical exercise in trying to guess what the artist is feeling. It’s supposed to be about the work, about expressing what the subject is thinking/feeling/experiencing. That means that it can’t just be about you. This isn’t to say that artists are, or the Art of Manliness promotes, selfishness. Far from it. It’s basically this: You are the work. You are the sculpture, the canvas, the silver tea service, the building. And you are surely a piece of art. Expressive, inexpressible, utterly unique, and cannot be duplicated. I asked Brett what his thoughts on the word have been since. “There is an ‘art’ to manliness,” he said. “There’s no exact rules to follow. Being a man requires you to develop certain attributes or virtues and then using your ‘practical wisdom’ or intuition on when best to apply those attributes.” And in utilizing those attributes, finding your mentors in your life, literature, and history, and flexing your manly muscles, you can create a unique work of art for the world to enjoy: you. But you also have to remember that you are merely a fellow journeyman. You are not the Master. You are the valuable result of the design sketched onto the Grand Master’s trestleboard. The Great Architect of the Universe (however you define that) designed you. And as a journeyman, it is your responsibility to craft yourself to His exacting standards–which He believes are absolutely, faithfully repeatable–so you can create an exemplary work of craft for the world to enjoy: you. The Art of Manliness and the Craft of Masonry. The two halves of you. 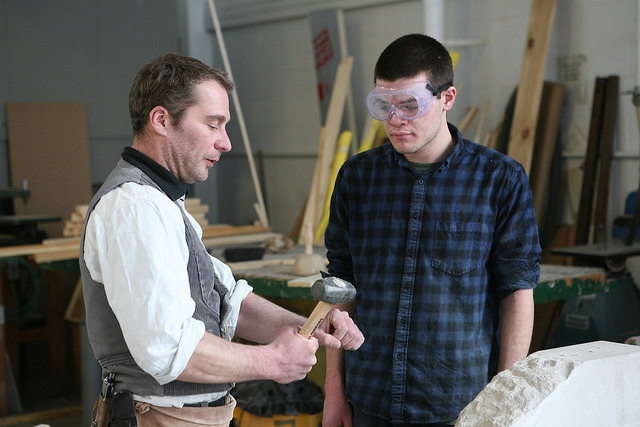 About the Author: Matt Gallagher is a Master Mason at Braden Lodge, and father of four. He has been a member of the Craft since 2010, blogs at Braden 168, and at his own blog at Stones ‘n’ Bones. His opinions are his own, and do not necessarily represent the thoughts or opinions of Braden Lodge No. 168. Truly captivating information and insight. Nicely done. Thank you so much.